Brenden Kalfus had three hits in the loss to San Francisco. Brenden Kalfus (BT '11) had an incredible week of small ball out at St. Mary's (CA). Kalfus was 9 for 14 with a run and four runs batted in this week for the Gaels. He even stole three bases after reaching base in the majority of his plate appearances. On the east coast, it was a very eventful week for the Big Train players at UNC-Wilmington. 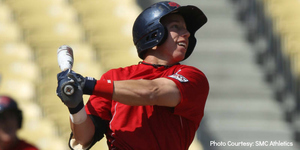 Michael Bass (BT '11-'12) extended a few streaks this week (3/10, 2BB, 4R, 2B, SB) but will have to put them on hold. Bass is currently holding a 24-game hit streak and a 30-game on base streak but sustained a minor ankle injury that has caused him to miss the last few games. The Big Train hope that he's back on the field soon. Luckily for the Seahawks, Drew Farber (BT '10-'11) was there to help them along. Farber reached base seven times including a triple, double, walk, and hit by pitch. He also scored four times and batted in two. Ricky Holden (BT '12) also helped the team out from the mound (5IP, 0ER, 3H, BB, 4K). Other notable pitching performances: Jimmy Reed (BT '10 / Maryland) - 8IP, ER, 5H, BB, 4K... Joe Mantiply (BT '10 / Virginia Tech) - 6.2IP, W, ER, 6H, 3BB, HBP, 7K... Hugh Adams (BT '06-'12 / Florida Atlantic) - 3IP, 3SV, 0ER, H, BB, 2K... Michael Boyle (BT '13 / Radford) - 5IP, W, 2ER, 2H, 3BB, 2HBP, 5K... Ryan Doran (BT '12 / San Diego St.) - 5IP, W, 2ER, 10H, 2BB, 2K... Mike Kent (BT '10-'12 / Clemson) - 5IP, 2ER, 9H, K.
Other notable hitting performances: Adam Barry (BT '11-'12 / High Point) - 7/12, 2R, 3RBI, HR, 2B, SB... Hunter Renfroe (BT '11-'12 / Mississippi St.) - 8/16, 3BB, 3R, 2B... Tyler York (BT '13 / Tallahassee CC) - 4/9, 4BB, 5RBI, SB... Michael Miedzianowski (BT '12-'13 / High Point) - 4/7, 2R, 2RBI, 2 3B... Mitch Morales (BT '12 / Florida Atlantic) - 5/12, BB, 3R, 3RBI, 2B... Brendan Hendriks (BT '12 / San Francisco) - 5/12, HBP, 2R, 2RBI...Tim Quiery (BT '11 / San Jose St.) - 5/11, 2R, RBI... Brennan Middleton (BT '10-'12 / Tulane) - 5/13, HBP, 2R.